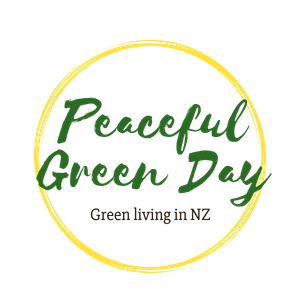 Peaceful Green Day: Chicken capture! There was great excitement around here on Sunday. I got a turn at being a heroine, and what a thrill it gave me! Number 1 chicken lady (i.e. the first neighbour to get chickens around here; I'm number 2) and her children paraded up our driveway asking if I'd lost a chicken. "Not me," said I. "But I know whose it is!" I dashed next door to number 3 chicken lady to tell her Apricot had been found. This bird had been missing for about six weeks! Being a white leghorn, she's naturally nervous and flighty, and being bottom of the pecking order in her flock of five hard had pushed her over the edge, we suspect. We converged on the nearby address that number 1 had given me, three mothers and four children, and then the work began. This wily thing was like the Road Runner cartoon - legs going so fast they were a blur - and as far as she was concerned she was running for her life. After several minutes of attempt after attempt to catch her, and all of us blocking every exit that wasn't fenced, she decided that the only escape was upwards and did a fly-jump onto a fence. I dived in (okay - lunged at speed) and just managed to grab her tail. She screamed blue murder and flapped madly, but I pinned her wings to her side and thrust her firmly into a waiting box. Phew. Check out this photo of her today... I think the floppy comb that characterises this nervous, active breed must flick around their eyes and keep them constantly thinking a hawk's swooping down to scoop them up for its next meal. How did she survive in the wild so long? We live near a patch of native bush, and she'd been living in it and obviously been scavenging enough snails and insects to keep her going, and presumably roosted in a tree (the same one each night, I imagine). These things are descended from Asian jungle fowl, remember. What brought her out into the street on Sunday I don't know, but there were at least three sightings of her that day. Today I was summoned to help clip her wing to try to prevent further escape. I firstly brushed up my skills with a little YouTube video, and the white feathers fell like ripe fruit. Just doing one side is apparently better because it unbalances the bird. The snipping causes no pain. How long she lasts next door is anyone's guess. This is one of Apricot's main adversaries. Check out her tackle! Her red bits are so huge and floppy she almost looks like a rooster. She lays daily now the days are longer, though, so really she's all girl. White leghorns are great layers and produce enormous pure white eggs. I'd keep this breed myself, but having seen the psychological problems my neighbour's ones suffer, whether it be due to genetic temperament or the constant threat of a flapping comb, I'm not going near them for my own flock. Having them over the fence, however, is rather fun.